Moving isn’t the easiest thing in the world. When you move from one home to another, you’re basically transferring your entire life (and your family’s life) to a new destination. What we recently moved between homes, we had too much stuff (more specifically, too much HEAVY stuff) to move by ourselves, so we had to hire a moving company. Out of all the movers we contacted, only one of them called us back, but they did a terrific sales job. He told me how all of their movers were bonded, how reliable they were, how careful they were, etc. etc. Most importantly, he promised me that they’d be at our home “sometime between 11 AM and 1 PM” to help us move. 3 PM… No movers, and my calls go to voicemail. 5:15 PM… No movers, and no return phone calls, but I get a promise that they will be there “first thing” tomorrow morning, between 8 and 9 AM. 10:14 AM… Finally, only 23 hours and 46 minutes later than expected, the movers arrive! Now let me ask… Regardless of how great a job they do moving our items from Point A to Point B, do you think I’ll ever use their moving company again? Do you think I’ll ever recommend their moving company to any of my friends or colleagues? If you asked me for a removal companies UK recommendation, do you think I’d be neutral, or do you think Id tell you to stay far away from this company? No because, each company is different and all strive in different areas. The reason that I’d never trust them again isn’t because the truck was late. I understand that trucks can get stuck in unexpected traffic or that they can break down… That’s not a big deal. The problem is that they PROMISED me the truck would be there, and then when they learned they couldn’t keep their promise, they didn’t do anything about it. If they’d simply called me to let me know the truck was running late, I could have rescheduled other errands I had planned, and gone on about my day. The truth is, I didn’t necessarily need them to be at the house at 11 AM or 1 PM. They could have come by at 3 PM or 5 PM or even 8 PM that evening, it wouldn’t have mattered. What I really needed was to be able to trust that they would show up, and to know that I could count on them to keep their promises. So what’s that got to do with winning jury trials and persuading jurors? There’s nothing wrong with making promises in opening statement. In fact, if you’re not promising the jurors anything during opening statement, you’re probably not giving them any reason to listen to you. But, if you are going to make promises during opening statement, you need to keep your word. If you don’t, your jurors will hold it against you, EVEN IF THE LAW DOESN’T REQUIRE WHAT YOU PROMISED! For example, let’s say that you’re a criminal defense attorney, and during opening statement, you promise the jurors that your client will testify, and that he’ll reveal who the REAL killer is during his testimony. But after the prosecution rests their case, you decide that they’ve done a horrible job, and don’t want to put your client on the stand because it will give the prosecutors a chance to resurrect their case. Even though the law doesn’t require you to prove who the real killer is, your jurors may still hold you to your promise. Jurors expect you to be a man or woman of your word. So, if you’re going to make any promises during opening statement, be prepared to deliver upon them. If you don’t tell them who the real killer is, they may think you’ve failed to meet your burden (even though you don’t have one), and may hold it against your client. But even when you can’t deliver on your promises because of circumstances beyond your control, all is not lost. The question is, can you explain to the jury why you’re unable to meet your promise? Better yet, can you get someone to explain it from the witness stand, so you’re not stuck trying to argue from your heels during closing argument? For example, if you intended to call Skipper Jones as a witness, but couldn’t call him because he died midway through your opening statement (it was too long and too boring, so he hung himself in the hallway), the jurors will want to know why Skipper Jones isn’t going to take the witness stand. Before you start playing Skipper’s video deposition or reading a written copy of his deposition, have one of the medical team testify (“That dude is dead”) so your jurors aren’t left in the dark wondering why he’s not there. They won’t like it as much as if you’d kept your promise, but at least they understand why you’re unable to keep your word. By being upfront and honest, you maintain your integrity with the jury, and don’t give them any reason to doubt you. In summary, here’s a good rule of thumb for making promises in opening statement: It’s better to underpromise and overdeliver. Make it easier than they thought it would be, and the jurors will thank you for it. Make it more difficult than you promised them it would be, and they’ll hold it against you until they reach their verdict. As a lawyer, your word should be your bond, both inside and outside the courtroom. Break it at your own peril! In your last case, how many times did you visit the “scene of the crime” before trial began? Once? Twice? Half a dozen times? Unfortunately, if you’re like many lawyers, the answer is probably “none.” Oh sure, you looked at photos, examined a map of the area, and listened intently as your witnesses described the scene, but when it comes right down to it, you never actually left the comfort of your office to go visit the scene. For as long as I’ve been a lawyer, I’ve always heard how important it was to visit the scene. Law school buddies said I should visit the scene, but I didn’t listen. Trial partners told me that I should visit the scene, but I didn’t listen. Judges and senior attorneys said, “Go!”, but I didn’t listen. Then one day, I found myself listening to someone whose advice I really trusted. This man’s worldly wisdom was more valuable than anything I’d ever learned in law school. He wasn’t a lawyer, but lawyers listened to him. In fact, his influence extended far beyond the courthouse walls. I have it on good authority that countless legislators, law school professors, judges (even a few Supreme Court Justices) still listen to everything he says, and will go out of their way to see him if he visits their town. In much the same way, going to the scene helps you “see” how the events unfolded, which lets you bring the action to life during your opening statement. Instead of cobbling together random details from witness statements and various reports, you simply transfer the images from your mind’s eye into your jurors’ minds. Q: Officer, when you turned on your lights and sirens, how close were you to the defendant’s car? A: About 2 car lengths behind him. Q: Where were you when you turned on your lights and sirens? A: On Main St., just past the Dunkin’ Donuts. Q: Once you turned on your lights and sirens, did he stop his car? A: No, he didn’t stop for about 250 yards, until he reached Miller’s Pub. Q: Were there any other safe places to stop his car? A: There were several, but he didn’t stop in any of them. Q: Just past the Dunkin’ Donuts is a Waffle House, right? Is that a safe, well lit, place to stop? Q: Once you turned on your lights and sirens, did he stop in the Waffle House parking lot? Q: What about the Applebee’s after that? Is that a safe, well lit, place to stop? Q: Did he stop in the Applebee’s parking lot? Q: How about Bennigan’s? Is that a safe, well lit, place to stop? Q: Did he stop in the Bennigan’s parking lot? A: No, he didn’t stop there, either. Q: Tell us about McDonald’s. Is that a safe, well lit, place to stop? Q: Did he pull over into the McDonald’s parking lot? A: No, he kept driving. Q: Bob’s Big Boy? Is that a safe, well lit, place to stop? Q: Did he stop in the Bob’s Big Boy parking lot? A: No, he drove right past it. Q: The Hess gas station, is that a safe, well lit, place to stop? Q: Did he stop in the Hess gas station? Q: Officer, where did the defendant finally stop his car? A: About 250 yards after I first turned on my lights and sirens, at Miller’s Pub. By visiting the scene, you can ask more intelligent questions and elicit more details from your witnesses. This lets you fill in all of the “holes” in their testimony and present a complete picture for the jurors. 3. Your cross-examination will be more lethal. Your witnesses and investigators don’t know as much about the case as you do, so they can easily overlook cross-examination insights which would seem obvious to you. When you visit the scene (rather than relying on second hand information) you will uncover clues that others wouldn’t even recognize as being important. Those clues may be the winning edge you need to poke holes in opposing witness’s testimony. Visiting the scene of the crime can make the difference between whether the jury “sees” what happened to your client or not. Your pre-trial preparation won’t be complete until you’ve visited the scene of the crime, so block off some time in your calendar and go. You’ll be glad you did, and so will your client! Don’t Think About a Purple Elephant! Do you feel the difference between the right picture and the wrong picture? You know that when you tell a guest, “These are our most expensive wineglasses — whatever you do, don’t drop them” that the glass will soon shatter on the floor. But when you phrase the same request positively, it completely changes the picture you create in someone’s minds. Changing the image changes the outcome. As a trial lawyer, you’re a wordsmith. It’s your responsibility to craft words with care and precision, creating verbal pictures that achieve your desired results. You have an obligation to your clients to maximize the persuasive impact of your messages. One simple technique you can apply to achieve that goal is to create the right pictures in your jury’s mind. You can do that by phrasing your language in the form of positive images, rather than negative images. 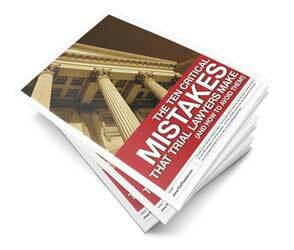 Prosecutors and plaintiff’s lawyers make the same mistake. They regularly ask the jury, “Don’t hold us to a higher burden of proof than required by law.” What do you think the jury is going to do after they hear that? Judges aren’t exempt, either: “Objection sustained. The jury must disregard that statement. Don’t pay any attention to that evidence.” If you had all day to think about it, you couldn’t come up with a better way to highlight that statement for the jury. Your goal this week is to find a better, more positive way, to illustrate your points during trial. Spend a few moments thinking about your last trial and review how you asked the jury to think about your most important points. How did you phrase your language? Did you phrase your requests positively or negatively? Did you ask for things you didn’t want? The picture that you paint in the jurors’ minds is likely to be fulfilled. What types of images are you creating? Focus on creating positive images in your jurors heads, and the persuasive impact of your courtroom presentations will improve immediately.